Habit: Perennial herb. Stem: angled or +- flanged, not winged. Leaf: stipules small, generally narrow; leaflets 4--10, opposite or subopposite, 1.5--8 cm; tendril branched, coiled, a bristle, or 0. Inflorescence: 2--10-flowered. Flower: calyx tube generally > upper lobes; corolla 7--16 mm. Fruit: glabrous. Lathyrus lanszwertii var. aridus (Piper) Jeps. Habit: Plant generally puberulent. Stem: generally ascending, not climbing. Leaf: leaflets narrowly lanceolate to linear; tendril often a bristle or 0. Flower: corolla 7--11 mm, pale lavender to purple. Chromosomes: 2n=14. Ecology: Open, dry woodland, meadows; Elevation: 1200--2000 m. Bioregional Distribution: KR, SNH, MP; Distribution Outside California: to Washington. Flowering Time: May--Jul Note: Intergrades with Lathyrus lanszwertii var. lanszwertii in California. 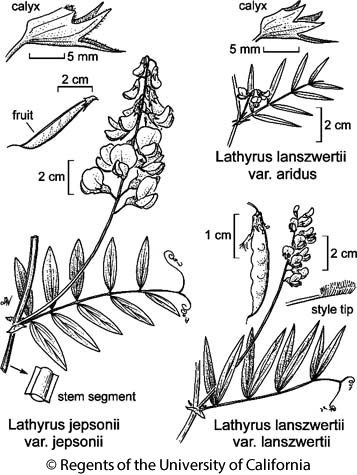 Citation for this treatment: Kelly Steele & Duane Isely 2012, Lathyrus lanszwertii var. aridus, in Jepson Flora Project (eds.) Jepson eFlora, http://ucjeps.berkeley.edu/eflora/eflora_display.php?tid=60617, accessed on April 24, 2019. No expert verified images found for Lathyrus lanszwertii var. aridus. KR, SNH, MP; Markers link to CCH specimen records. Yellow markers indicate records that may provide evidence for eFlora range revision or may have georeferencing or identification issues. Purple markers indicate specimens collected from a garden, greenhouse, or other non-wild location.